﻿ Nani: "I'm tired of always being compared with Cristiano Ronaldo"
05.09.2011 » Nani: "I'm tired of always being compared with Cristiano Ronaldo"
In an interview granted to Manchester United official magazine, Nani confessed that he is tired of being compared with Cristiano Ronaldo, year after year. Nani joined is going for his 5th season with the Red Devils and his career so far have plenty of similarities with Cristiano Ronaldo. 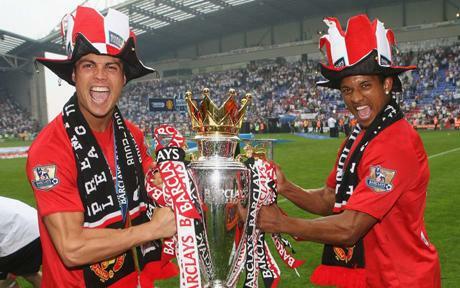 Nani joined Manchester United 5 years ago, when Cristiano Ronaldo was also playing for the Red Devils, in England. However, the press has been comparing Nani and Ronaldo over and over, since they started playing for Sporting CP (their age difference is only 1 year). They both joined Manchester United very early in their careers and they play preferably in the wing. Nani has been a target of criticism for being too selfish in his first years in England, but managed to impose his footbal and develop into a more game-aware player over the years, which is something that Cristiano Ronaldo has also gone through in Manchester United. Nani is confident that this can be his year: "This is a good chance to show everyone I can still do more and that I am a mature player. Last season was definately my best professional year, since I managed to be consistent, but now I hope this can be my year of affirmation. I will give my best!" Nani: "I always work hard to have success and help my team winning titles. I've been present in the most important moments that this club has been through over the last years and that is great." The only thing that seems to bother Nani at this point are the constant comparisons being made with Cristiano Ronaldo. Nani: "Over the last 5 years, the question is always the same... It's always about Cristiano Ronaldo. Everyone tells me I have to be more like him, and they ask me if we practice the same things or if I think I can do the same things he does by now. Everytime I do something good here in Manchester United, I get asked the same thing and when I have a bad day, they simply don't say anything. It's tiring to always be compared with Ronaldo, whenever I do something good for the club. But that's ok, it won't change the way I am." Real Madrid next fixture in the Spanish League La Liga, will be on Saturday (10th of September), against Getafe in the Santiago Bernabeu. You may watch Real Madrid vs Getafe match live streams this Saturday (10-09-2011), inside our Live Games Streams section. Cristiano Ronaldo will be on the line-up in Real Madrid vs Getafe. The countdown clock timer, displaying the time left for the upcoming Ronaldo game, is shown on the top right corner of all pages.